“I eat to ride, I ride to eat. At the best of moments, I can achieve a perfect balance, consuming just the right amount of calories as I fill up at bakeries, restaurants or ice cream parlours. On the road, I can get about twelve miles to the quart of milk and a piece of baker’s apple tart." Now that we have covered strength training, the next area that I have been investigating is nutrition. To nobody’s amazement, there is a lot wrong with the way people eat generally: one-third of all added sugar in the American diet comes from the consumption of soft drinks, and French fried-potatoes are the primary vegetable. 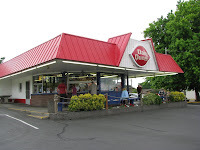 According to a Johns Hopkins University study every single American adult could be overweight by 2048. Current prevalence of obesity and being overweight is 71 percent, which is nothing to crow about since it was only 57 percent in 2000. We all know that cycling is a good way to get the pounds off but what happens if you want to push up the performance beyond just losing some weight? 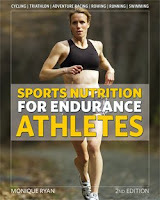 I would very much recommend you read Monique Ryan’s “Sports Nutrition for Endurance Athletes.” The 2nd edition of this book came out in 2007 and from what I see it remains the Gold Standard for anyone interested in this subject. The first part of the book deals with the basics of nutrition in order to establish a base. You learn a great deal about the building blocks: carbohydrates, fats and proteins, along with information on hydration, and vitamins and minerals. Much of this information is available elsewhere easily enough but the writing here is very straightforward and easy to understand. There is a detailed discussion of the Glycemic Index and what it means in terms of building your diet. Helpfully, the author refers to the needs of those following a vegetarian regime as well. Part II of the book is “Your Training Diet” and covers the rather complicated principles of an endurance athlete’s diet. Not only will you arrange the type of foods you eat depending on what stage of your periodized training you are in but you also have to determine the correct calorie levels to maximize effectiveness, including recovery. There is a specific section on the nutritional requirements for building muscle that is quite detailed. Supplements get their own section, although the chart on p. 187-188 summarizing them does not pull any punches about their effectiveness (or lack thereof). It was interesting to note that the National Collegiate Athletic Association (NCAA) policy on supplements prohibits the providing of muscle-building products such as the popular creatine and even protein powder by a collegiate institution to its athletes. There are real concerns about the contamination of products: the International Olympic Committee found in a study that 15 percent of 600 over-the-counter supplements included non-labeled ingredients that would have resulted in a positive doping result. With all this useful information, the reader is now set to go into the last section of the book which covers nutrition planning for specific endurance sports. Of particular interest to me is Chapter 9, which covers multiple cycling disciplines: road cycling, mountain biking, track cycling, cyclo-cross and even recreational distance riding. The fact that refueling on the bike is a simple task compared to running or swimming is a good thing, given that fluid and carbohydrate demands during training are so high. Other endurance sports covered in Part III include rowing, running, triathlon and swimming so if you do cross-training this is useful as well. Throughout the book one finds valuable sidebar pieces on training in the heat or at altitude and how you can deal with this through proper nutrition. The book concludes with Appendices that cover the Glycemic Index of Foods, a comparison of vitamins and minerals and another on sports nutrition products. Appendix D is very important as it is a guide to planning meals, including snack ideas and tips on reading labels. There is even a section on dealing with restaurants and good choices to make and another sidebar with useful tips for vegetarians. Appendix E has sample menus, which look a bit boring but are only a guide and show you breakdowns by carbs, fats and proteins for the base, build and transition periods of training (with vegetarian alternatives). This is not a cookbook but explains what fuel you need to participate in endurance sports. Taking these basics there is no reason you cannot come up with attractive and nutritious meals to suit your taste. I have referred before to www.fitday.com, which is a very easy-to-use website that allows you to record what you have eaten and quickly learn the amount of calories you have consumed and their composition. One of the lessons I take from this book is that different sports and different periodized elements require varying nutrition. Nutrition is a key to success and while this book is aimed at competitive athletes it is so well-written that everyone with an interest in what they eat and in their physical performance will want to read it.